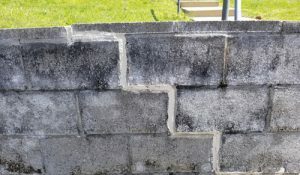 New Retaining Wall? Choose Versa-Lok Retaining Wall Systems from D-Bug. 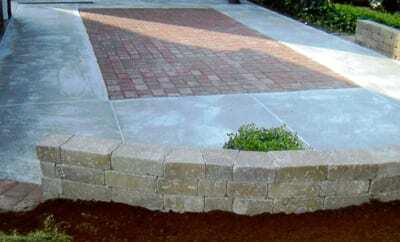 Does your retaining wall contractor know waterproofing? Water is the primary force behind the destruction of landscaping walls. In winter, when plant growth slows, water saturates the ground behind your retaining wall. It freezes and expands, exerting enormous pressure in all directions. Spring rains add moving water to the threat. A contractor unfamiliar with the behavior and movement of water may only be setting up a target for the weather to destroy over time. At D-Bug Waterproofing, our retaining wall builders are experts in landscape grading, redirection of water flow, and the proper installation of wall footers, backfill, and French Drains. We use the finest Versa-Lok retaining wall systems, giving you an outstanding result that improves the value of your home, provides curb appeal, and will last a lifetime. Retaining walls are used to secure hillsides and banks or to improve the cosmetic appearance of a home or its landscaping. They serve a number of purposes. 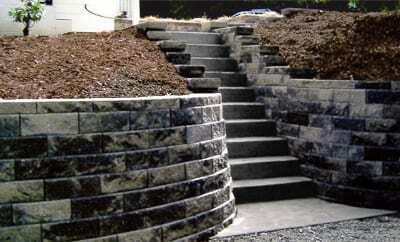 To make sure you enjoy all these benefits, we primarily use the Versa-Lok retaining wall system. We prefer Versa-Lok because it allows for walls to be built straight or curved. Versa-Lok blocks can be used to make inside or outside corners and even steps. When D-Bug installs a Versa-Lok block wall, a level surface approximately 16 to 24 inches wide is prepared. Next, 6 to 12 inches of modified gravel base is applied and tamped level. Then we lay the Versa-Lok blocks, making sure each block is level in both directions and even with the block beside it. Every row of blocks is pined together and stepped back 3/4 inch as the wall is built up, stepping into the hillside. Finally, the wall is back filled with sandstone gravel or river rock and cap blocks are positioned on top and secured with Versa-Lok concrete adhesive. Many styles and colors of Versa-Lok block are available to meet your needs. Omni-stone is a durable, high-quality paving stone. Omni-Stone make a beautiful patio, side walk, or driveway and is available in a wide variety of colors, sizes, and styles. Eight to 16 inches of modified gravel is used for a base, then the omni-stones are placed. If omni-stones are installed properly, they make for a long-lasting patio your family will enjoy for many years to come. Why Call D-Bug Instead of a General Contractor? Western Pennsylvania is a land of hillsides, rain, and winter freeze-thaw cycles. These are the same forces that cause foundations to leak and basements to flood. At D-Bug Waterproofing, over 75 years of service and experience have taught us how to build with these forces in mind. Retaining walls, driveways, patios — we know the best materials and the proven techniques to grade surfaces, build walls, install French Drains, and take all the actions needed to ensure you receive the most for your investment. At D-Bug Waterproofing, we know more than almost anyone else about waterproofing and retaining wall systems. Call us at 1-855-381-1528 or visit our Contact Us page today.